You are supposed to help people, so don’t think I am faulting people for that. I’m not faulting anyone for anything. And, also, is “faulting” a word? No, what I’m doing is just reporting back about a day where I witnessed Good Samaritans coming out the yin yang. This is a good thing. The world needs more days of Good Samaritans coming out of the woodwork. Can I get an Amen? Annnnnnnd, the teenager veers off the wet pavement and settles her little car nicely into the roadside ditch all snug and comfy-like just before she was to stop at a red light. “Did you see that?” We all said together as we drove by her as it happened. We quickly made a U-turn, pulled over and out of the way of traffic, which meant we weren’t right next to the girl. My husband got out of the car and walked over to her. She was on her cellphone and had already called for help. A police officer and a wrecker were on their way. My husband told her that we would wait in our car until they got there. And, thus began the sea of Samaritans. Since we weren’t right next to her, everyone thought they were they first responders. Bless their sweet, little hearts. Every few minutes, you’d see a person hastily pull over and get out. Every few minutes, people would pull up alongside us. It really was almost comical. 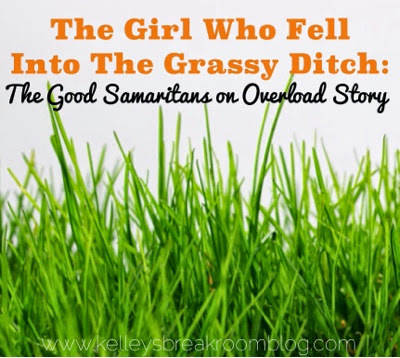 Person after person carefully high stepped it through the long wavy, wet grass to peek through her car window to check on her not realizing they were the 43rd person to do it. I could see the look of satisfaction on everyone’s faces as they stopped to offer help, especially given the fact that it was sprinkling! They saw an area where they could immediately give and they did not hesitate. A little rain wasn’t stopping these heroes!! This is a very good thing. Unfortunate for all of them, though, because we were the rightful heirs to the Good Samaritan of the Day crown. We were first, you know? Eventually, she got out of the ditch, of course. Still, every time I pass that area, I call over my shoulder to the boys, “Look, that girl just ran her car into the ditch” and every time they look. It was sort of an exciting thing for our community. It was the best combo of someone needing help but not being hurt at all. It was a chance for the good Samaritans of this area to shine. It was a chance for us all to give ourselves a sticker. It was a chance for us all to pat our own backs. We didn’t see her first. I learned that devastating news as we drove off that day when we saw the other car that had been there before us. Our Hero Vision had initially clouded our view. Got me right in the ticker.